MyBinding.com carries the full line of GBC Velobind binding machines, supplies, and hard cover cases. Whether you are looking for a machine to use with GBC's four pin reclosable supplies, a hot knife system, or a debinder tool, we have the machine to meet your needs. Choose from the GBC V110e, System One, Two, Three, or Four. Or go with a less expensive SecureBind option from Tamerica. All of these systems use the same awesome strip binding technologies to produce documents that are either editable (4-pin) or tamper resistant (hot knife). MyBinding is your one stop Velobind Shop. Get your covers, strips, machine and debinder all at the same time and all at excellent prices. Welcome to MyBinding video. Velobind & Surebind are great binding systems with its clean and simple look and a potential for high level security, it’s a great choice. At MyBinding.com, we carry all the GBC system 1, 2, and 3 Pros. We also carry some small 4 pin punch and go types of systems. Both the V50 and the V110E are very popular and make for quick easy binding. 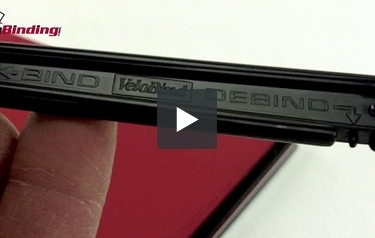 After GBC acquired Velobind, they continued to produce the system 1, 2, and 3 Pro. This is an 11-pin hot knife binding style. It has a high level security because the machines are expensive and should somebody try to edit the documents, they would need the same machine to rebind the book. And it’s called hot knife because it’s a heating blade that cuts off the excess pins and creates a small binding strip that is securely riveted. The 4-pin documents are not very secure and they can be unbound and rebound with a simple tool which is very convenient for most documents as editing is inevitability. The 11-pin or hot knife documents cannot be edited so easily. Simply, this razorblade rips off all of the rivets and you have to rebind it with the same machine. There are plenty of Velobind Surebind strips and supplies on our website but feel free to give us a call or instant chat with us so we can help you find exactly what you need and the machine that is best for your purposes. There are also a few brands on the market that work hand in hand with the Velobind system. There are less expensive and sometimes have seeming unique features. But whatever it is you need, hardcover, soft cover, various colors of strips, we have it for you. Just give us a call, a click, or a chat. For more demos, reviews, and how-to’s, check out MyBinding.com.